Oregon is a food lover’s paradise and not just in Portland, but in every town across the state from our rugged coastline to our high desert countryside. For the Bounty issue, 1859 interviewed chefs, farmers, ranchers and artisan producers to divine which one quintessential ingredient or dish best represents each of our seven regions. As we taste-tested our way across the state, one theme became clear: community is at the heart of everything we do best. 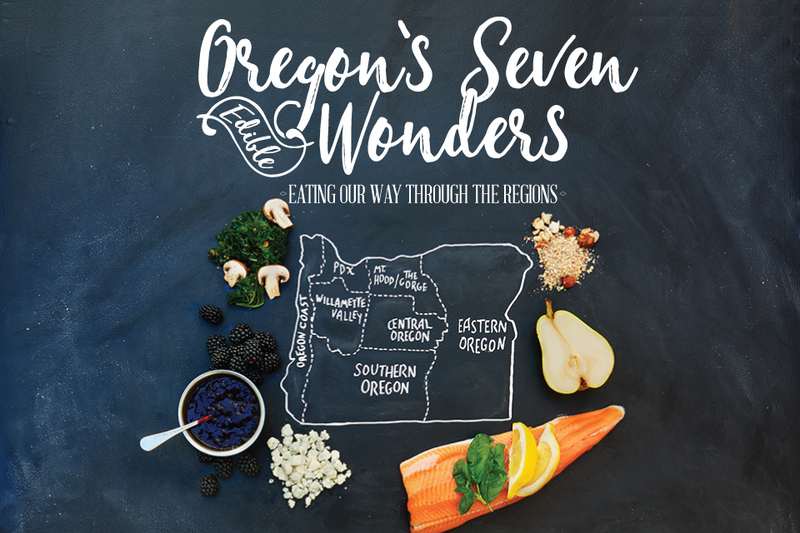 So come with us on a culinary tour of Oregon to discover the iconic foods that represent each of the seven regions of our delectable state. Then gather your neighbors around the table, make the recipes and celebrate Oregon’s incredible bounty. Like honey bees to nectar, Portland attracts some of the world’s greatest chefs. Ask ten of the city’s best chefs what one ingredient rules the local food scene, and you’ll get ten different answers: native salmon, strawberries, Dungeness crab, smoked trout, grass-fed beef, hazelnuts, mushrooms, the list goes on. One thing they’ll likely all agree on is that, in this city, brunch rules the roost. If you don’t have all day to dedicate to brunch, then there are plenty of lighter options (with shorter lines) around town. At nearby Tabor Bread, owner Tissa Stein bakes an impressive array of whole grain breads and wholesome treats, with local grains milled daily on-site. Stein’s marinated kale sandwich recipe, which we promptly made at home, especially inspired us, and, of course, we had to top it with a fried egg from one of Portland’s many backyard chickens. 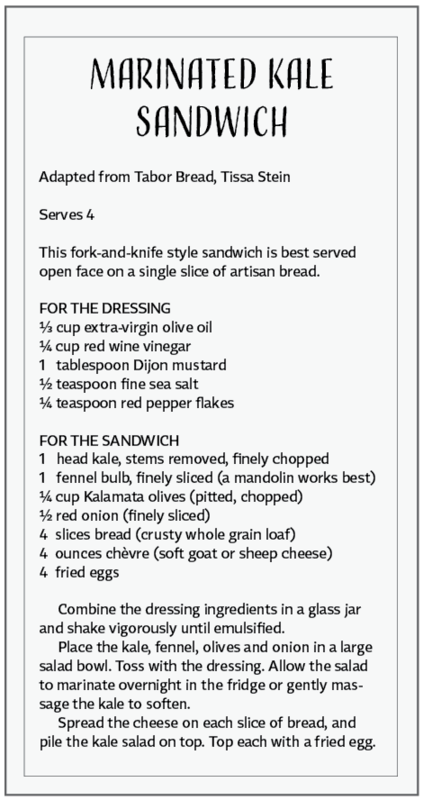 This fork-and-knife style sandwich is best served open face on a single slice of artisan bread. Combine the dressing ingredients in a glass jar and shake vigorously until emulsified. Place the kale, fennel, olives and onion in a large salad bowl. Toss with the dressing. Allow the salad to marinate overnight in the fridge or gently massage the kale to soften. Spread the cheese on each slice of bread, and pile the kale salad on top. Top each with a fried egg. 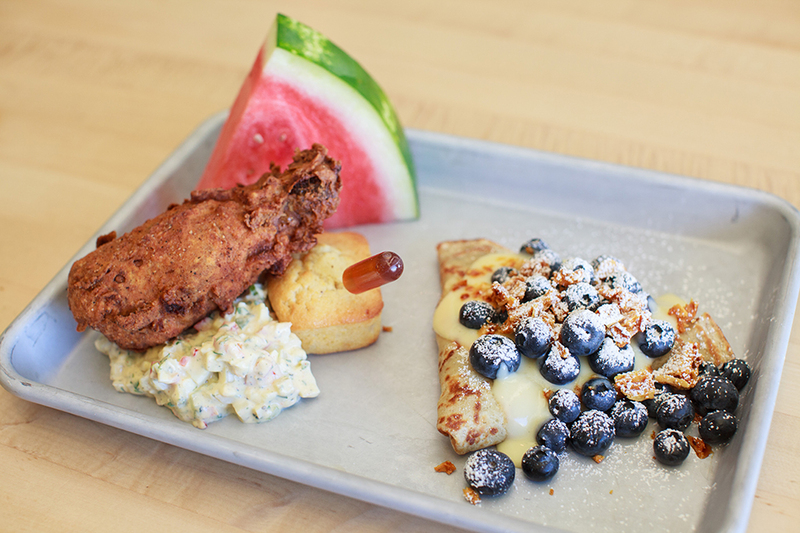 Weekend brunch at Portland’s popup HunnyMilk features dishes like this fried chicken drumstick, toasty cornbread, fennel seed honey, egg salad, watermelon, left, and vanilla bean crepe with blueberries, lemon curd and honeycomb crunchies. 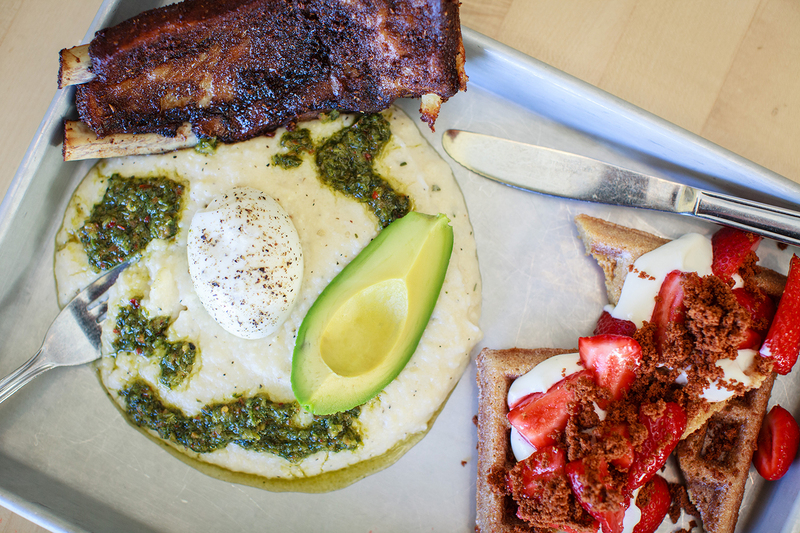 Weekend brunch at Portland’s popup HunnyMilk features dishes like this crispy pork ribs with cheesy garlic grits, slow poached egg, avocado and chimichurri sauce on the left combined with graham cracker waffle dipped in honey butter with cheesecake mousse, chambered strawberries and brown butter bits. 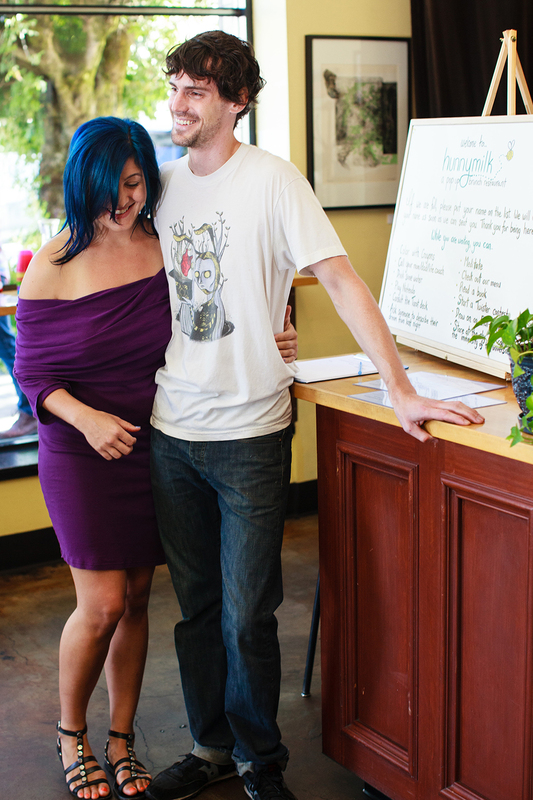 HunnyMilk owner Brandon Weeks, with Alex Franzen, left, have located their popup brunch restaurant in La Buca restaurant located at 40 NE 28th Ave. in Portland. 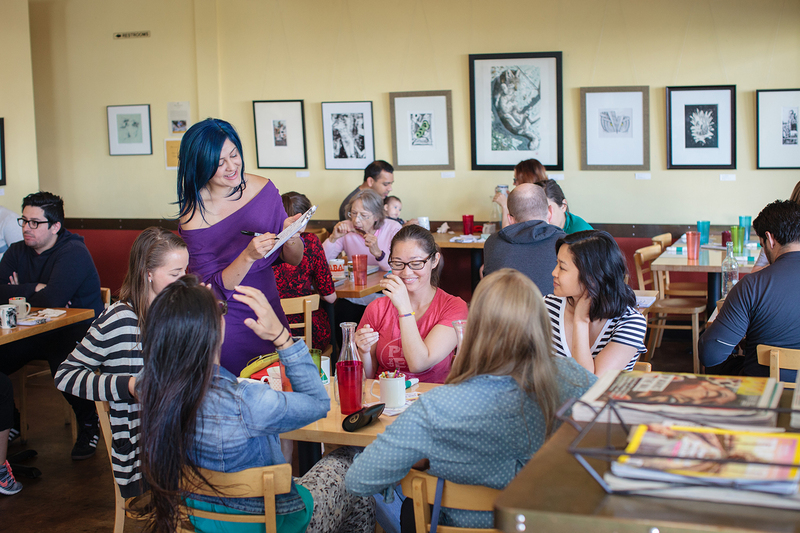 HunnyMilk server Alex Franzen takes an order from a table during Sunday brunch in Portland. The popup weekend brunch restaurant in Portland features single price meals. Take a scenic drive through the Willamette Valley, and you might feel like you’re in a lush wine region in France. The valley has some of the most fertile farmland in the Pacific Northwest. While this region is most famous for its pinot noir grapes and its wide range of awe-inspiring produce, however, berries and hazelnuts best represent this region. In fact, Oregon produces ninety-nine percent of hazelnuts in the United States thanks to the Willamette Valley. No recipe better combines berries and hazelnuts than a simple crumble. Top your crumble with Cassie’s Hazelnut Cookie Crust, and you’ll be booking your next weekend getaway to the Willamette Valley. This recipe makes enough cookie dough for three crumbles. Freeze the extra dough for future crumbles or bake it into cookies. Preheat the oven to 400 degrees. In a large bowl toss together the blackberries, lemon juice, zest, sugar and cornstarch. 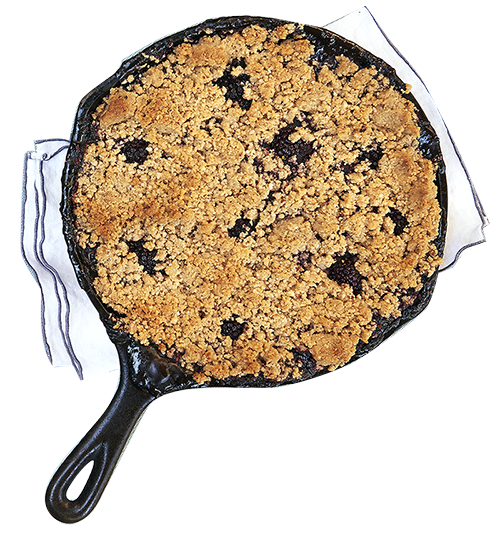 Spread out in an 8-x-8-inch baking dish or a 10-inch cast iron skillet. In the same bowl, cream the butter and sugar with a handheld mixer. Add the egg, molasses, vanilla, cinnamon, salt, baking soda and baking powder. Beat until combined. Add the hazelnuts and flour; use your hands to combine. Crumble 1/3 of the cookie batter evenly over the berries. Place in the center of the oven. Bake for 18 to 20 minutes, or until the cookie topping is golden brown. Serve warm with a scoop of vanilla ice cream. Three hundred and sixty-three miles of rugged coastline dotted with quaint fishing villages means endless opportunities to reel in a fresh catch. 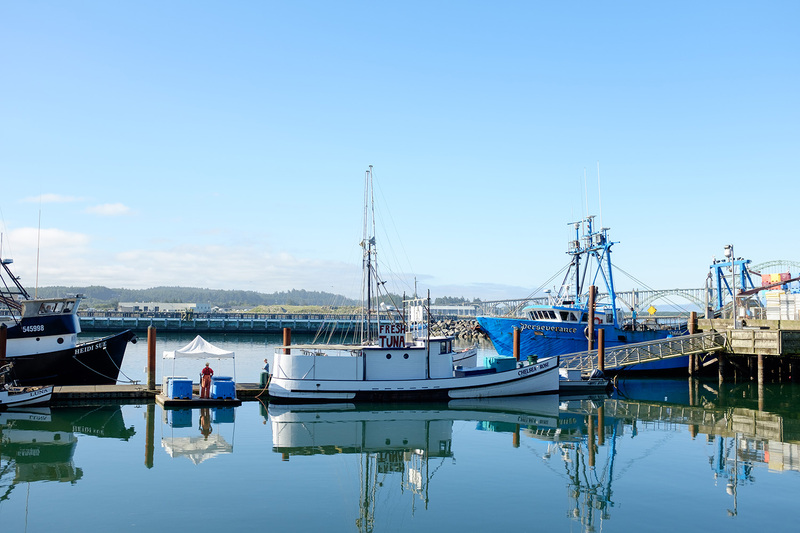 Seafood rules the Oregon Coast culinary style. 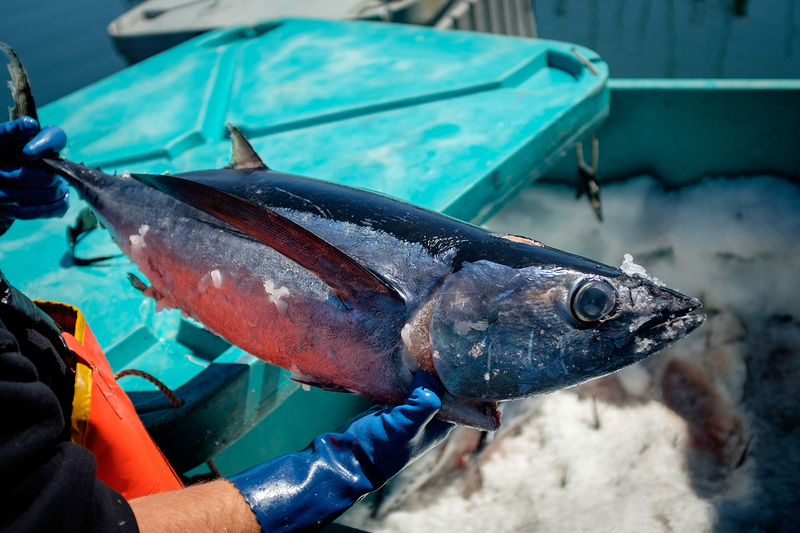 We spoke to local restaurateurs, Leah Van Hook and Laura Anderson, and both agreed: albacore tuna is the one fish that represents the coast. Anderson has since outgrown tuna casserole and now favors her revitalizing tuna recipes. Note: Since the tuna is left raw, it should be purchased from a respectable fishmonger and allowed to marinate in the dressing for at least 5 hours or overnight. Combine the dressing ingredients in a pint-size glass jar. Place the tuna in a gallon-size zipper bag, with ¾ of the dressing, and marinate overnight in the fridge. Rinse the wakame and soak in water for 5 minutes, then drain immediately. In a medium bowl, toss the wakame, edamame, oranges, cilantro and onion with half of the remaining dressing. Taste and add more dressing, if needed. Arrange the seaweed salad on a serving platter, top with the marinated tuna, and sprinkle with sesame seeds. 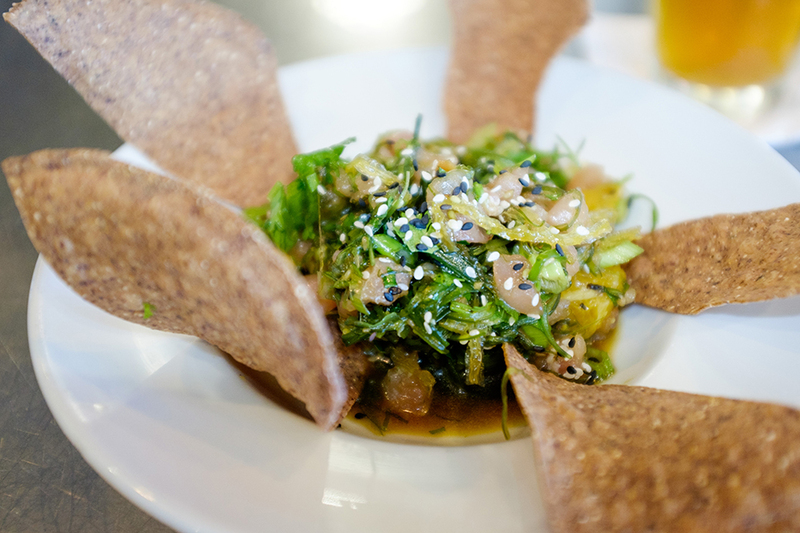 Local Ocean chef Laura Anderson offers this Albacore Tuna Poke with Seaweed Salad as an Oregon Coast favorite. A fishmonger mans his morning station on the docks at Newport. 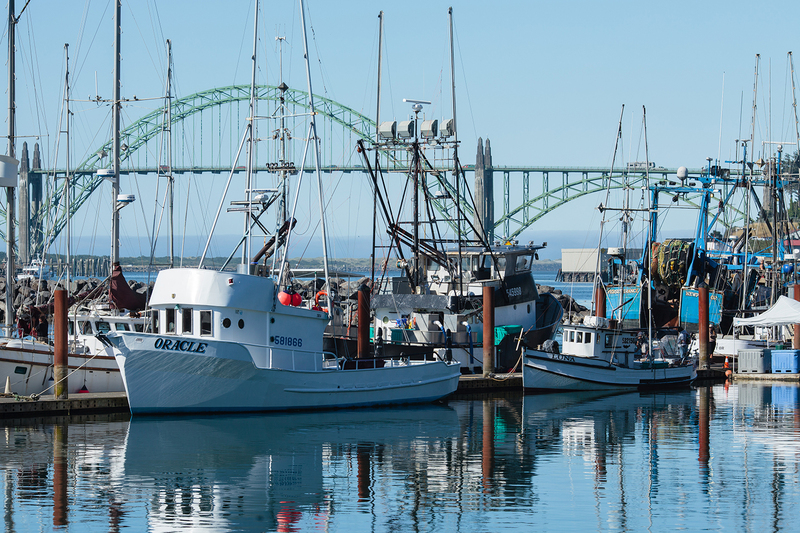 Oregon has an entire border on the Pacific Ocean — fishing communities like the one in Newport, Oregon help shape the palate and business of fresh seafood. 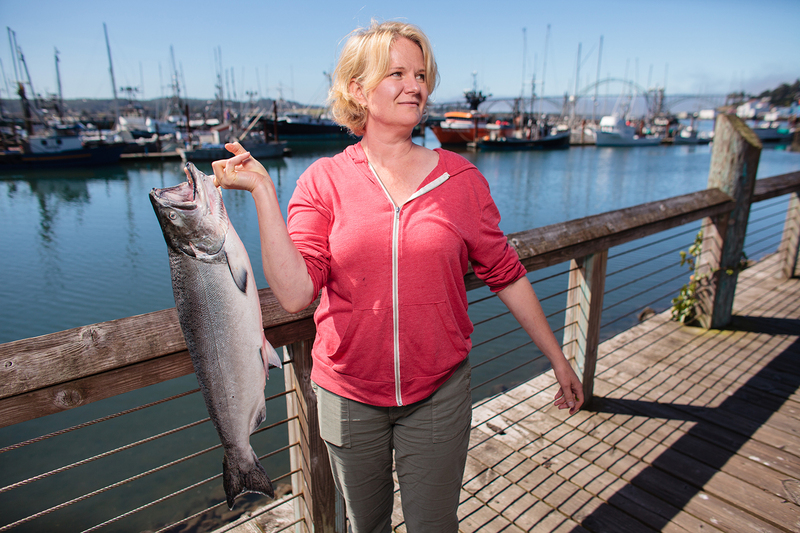 Laura Anderson, holding fresh salmon in front of Newport’s fishing fleet, grew up fishing with her dad who was a commercial fisherman. Anderson opened her restaurant and market, Local Ocean, over a decade ago. 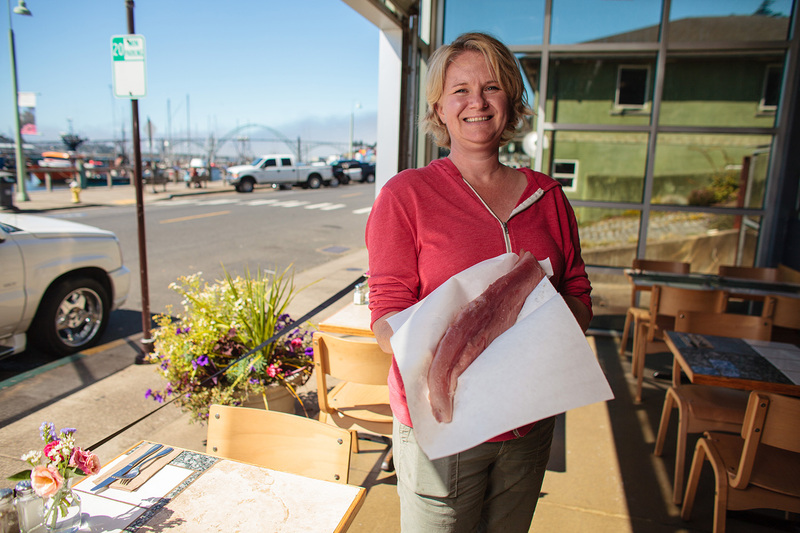 Local Ocean chef, Laura Anderson displays a tuna filet from her restaurant located across the street from the commercial fishing fleet in Newport where her company purchases fish from 60 boats year round. Fresh Albacore Tuna is a favorite up and down the Oregon Coast. Hiking, skiing, fishing, trail running, mountain biking, golfing … the opportunities for outdoor adventure in the high desert and mountains of Central Oregon are endless—and that means big appetites abound. When it comes to hearty cuisine, Central Oregon doesn’t disappoint. Chef Lisandro Ramón, owner of Brown Owl, calls Bend “Cow Town” and said a grass-fed burger is definitely the one dish that represents Central Oregon, especially since burgers pair heavenly with Bend’s craft beers. Memorable dishes we found. 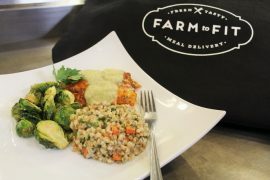 When we asked chef Justin Brown, owner of Kokanee Café in Camp Sherman, about the one dish that defines this region he said, “Our local farms, harnessing the water from the Cascades, are growing a wider range of products than we have ever gotten from this region before. That paired with our rivers—the Metolius, Deschutes, Crooked—gives us our identity.” To Bodi, that means fresh trout-seasonal, stuffed and grilled—is the quintessential Central Oregon dish. It’s worth making a trip to the Metolius River and Camp Sherman to experience this dish, or reel in your own fresh catch and try Brown’s recipe at home. Combine the spices, salt and cornstarch. 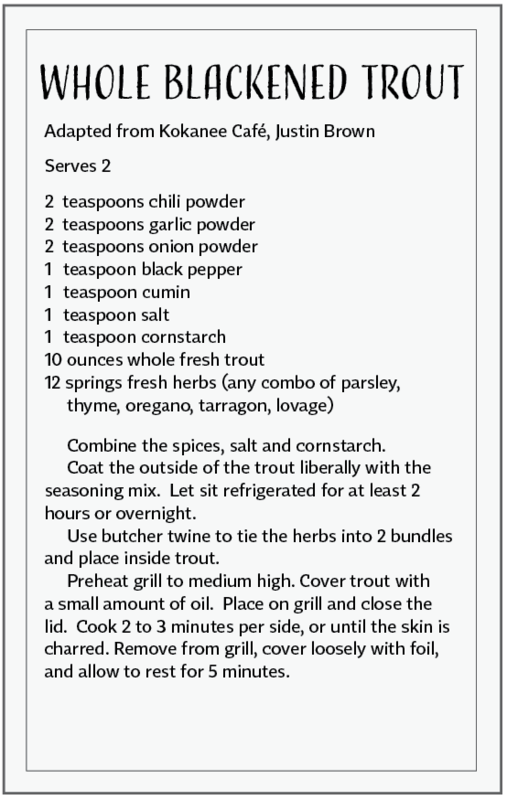 Coat the outside of the trout liberally with the seasoning mix. Let sit refrigerated for at least 2 hours or overnight. 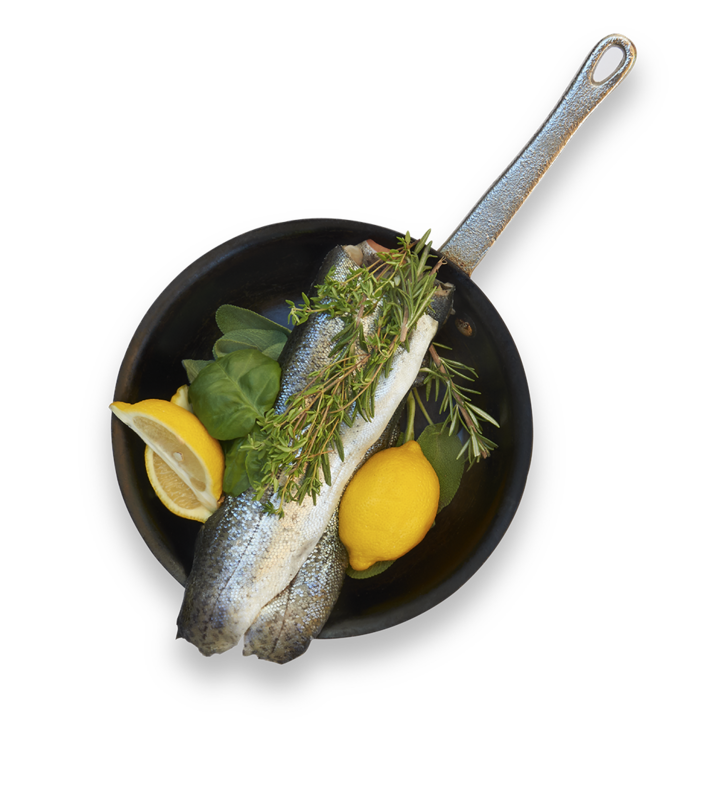 Use butcher twine to tie the herbs into 2 bundles and place inside trout. Preheat grill to medium high. Cover trout with a small amount of oil. Place on grill and close the lid. Cook 2 to 3 minutes per side, or until the skin is charred. Remove from grill, cover loosely with foil, and allow to rest for 5 minutes. 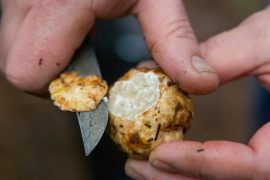 In the fertile foothills of Mount Hood, the local chefs and farmers agree that the one quintessential ingredient that defines their region is a perfect end-of-summer pear. 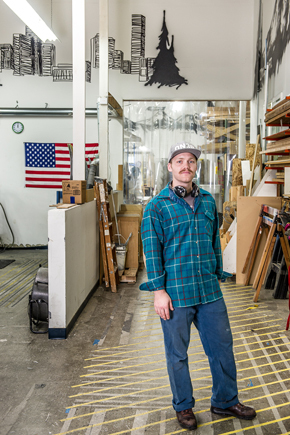 In fact, Hood River is our nation’s largest pear-growing region, exporting an impressive variety all over the world. Cook bacon over medium heat in a skillet until crispy. Transfer to a paper towel to cool and then break into pieces. Combine the dressing ingredients in a glass jar and shake until emulsified. 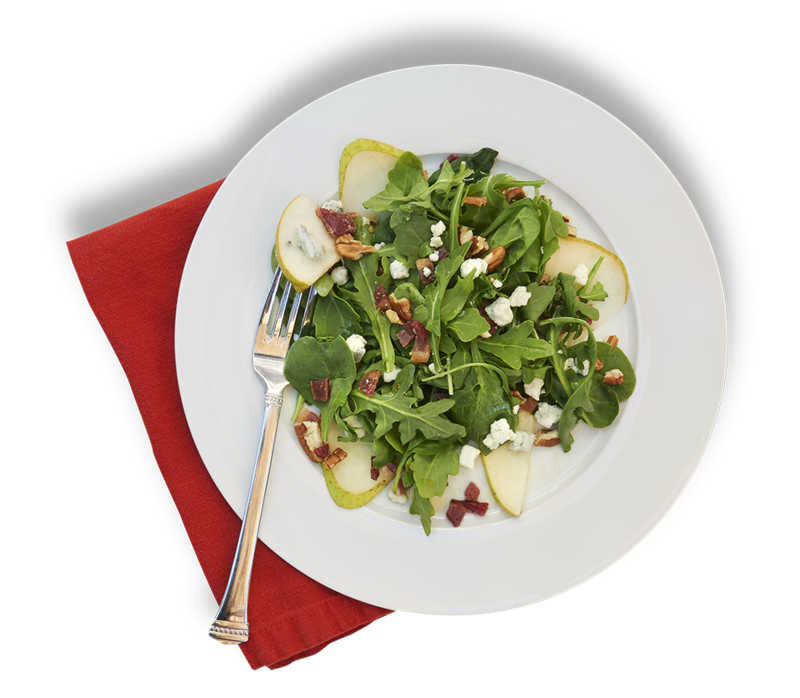 Divide arugula among four dinner plates and top each with the bacon, pear, pecans and blue cheese. Drizzle the dressing over top. Southern Oregon, with its rich agriculture valley, is a haven for farmers, vintners, cheese makers and food lovers. In a region that produces award-winning wines, grows a vast variety of pears, peaches, berries, and has beautiful vegetables in season year-round, it’s difficult to distill the place down to one ingredient. We had to agree. 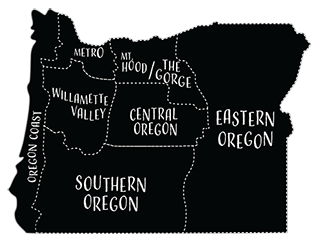 When we think of Southern Oregon we dream of sinking our teeth into a wedge of Rogue Creamery cheese, so we went straight to the source and spoke with David Gremmels, the president and cheesemaker of Rogue Creamery. Gremmels’s description of the region, the local ingredients, the incredible restaurants and the dedication to sustainability was enough to make us want to pack up and move south. 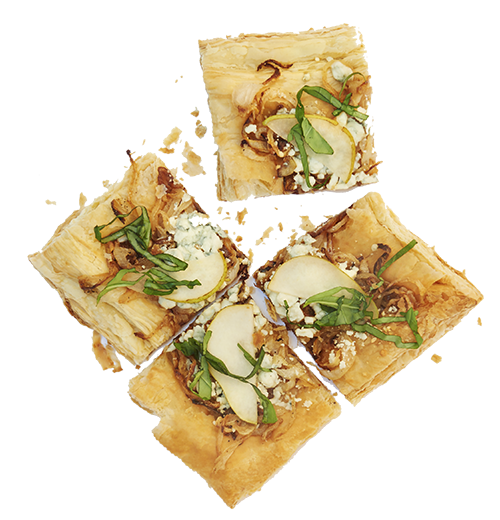 Lucky for us, chef Flattley shared with us her blue cheese tart recipe, a favorite appetizer of Gremmels. This dish has been on the menu at Coquina since it opened (and for good reason). 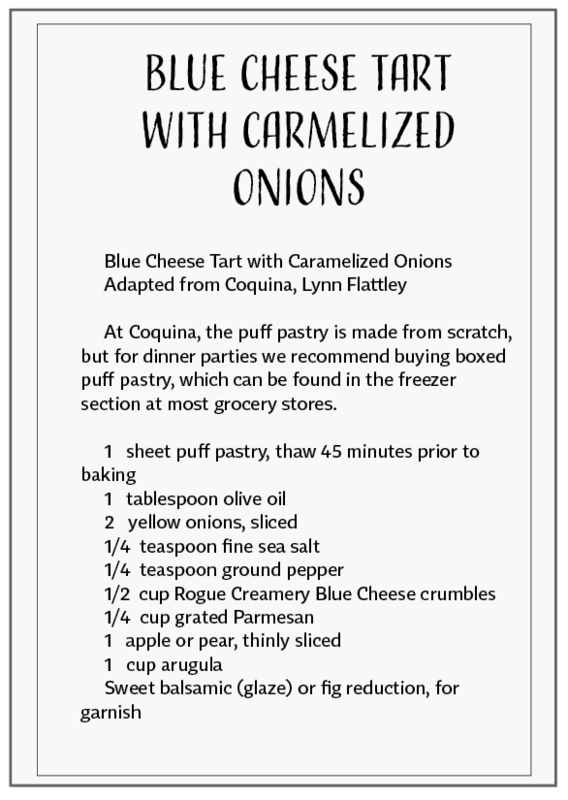 At Coquina, the puff pastry is made from scratch, but for dinner parties we recommend buying boxed puff pastry, which can be found in the freezer section at most grocery stores. Farm-to-table dining in Eastern Oregon beckons beef as the centerpiece of the meal. After all, this is cowboy country, where herds of happy cattle roam free on the open range. In a trip to Eastern Oregon, you can stock your freezer with some of the most flavorful and nutritious beef in the country. What intrigued us most about 6 Ranch is its “always open” farm stand on the main thoroughfare between Lostine and Enterprise. McAlister’s heartwarming stand came into existence after she had the opportunity to attend Slow Food Terra Madre in Italy. 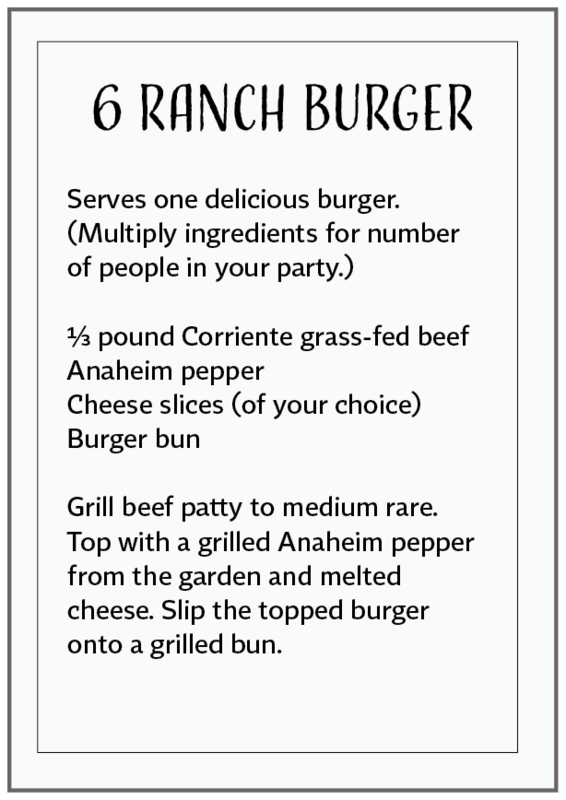 We begged McAlister to share her family’s coveted burger recipe and were surprised to learn it’s a dish that requires no written recipe. Because the beef is so fresh and flavorful, her family adds no fillers or seasonings to the meat (not even salt). 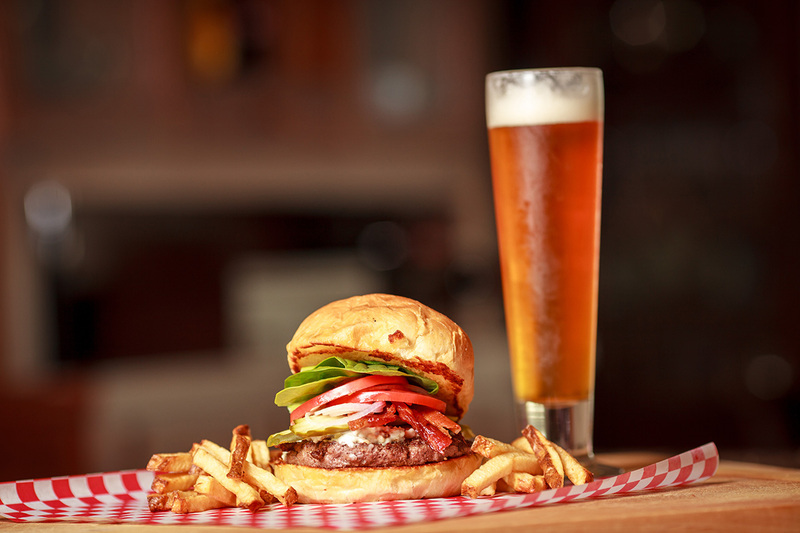 The 6 Ranch burger can be found on the menu at Terminal Gravity Brewery, the sought-after watering hole for locals and tourists. Terminal Gravity represents the spirit of the Wallowa Mountains with its local-ingredient driven menu and refreshing IPAs. Simplicity at its best. Grill beef patty to medium rare. Top with a grilled Anaheim pepper from the garden and melted cheese. Slip the topped burger onto a grilled bun. Oregonians east and west love their hamburger. This is a sample from Bend Burger Company.